It’s a warm, sunny day and you’re enjoying a bit of fresh air and beautiful weather. You happen to be petting your dog and notice something odd. A dark discoloration of his skin near his belly, that looks almost purple or blue in color. Or maybe you’re scratching his ears and notice small, reddish or purple-looking dots along the underside of the tender skin, just beneath the surface. Sometimes, pin-point dots are also visible in the whites of the eyes. You may be wondering, can dogs get bruises? Is it even possible? Try not to stress. What you could be seeing is in fact bruising of some type. Though it’s not common, dog bruises can happen. The key is to figure out the cause of the bruising on your dog so you can make sure there is nothing more serious going on. Can a Dog Get Bruises? Yes, though typically, bruising is not something you see often in dogs. Dogs have thicker skin than humans do, along with a (sometimes) thick coat of hair or fur. Both of these factors serve to protect a dog from bruising related to the playful or rouge behavior that is typical in his everyday life. Because bruising is not something you see very often, if you do notice your canine has a bruise, it could be they have recently experienced a traumatic event or swallowed something they shouldn’t have that is poisonous. They could also have some underlying canine health concern you may not yet be aware of. Toxic substances like aspirin and rat poison can cause allergic reactions in dogs, as can injuries and wounds. If your dog hasn’t suffered an injury or ingested anything dangerous, the bruising could be related to internal injuries and bleeding that you may not be able to see. Sometimes bruising manifests as the product of an underlying health condition that affects a dog’s platelet counts and blood clotting abilities. What Causes Bruising in a Dog? A bruise is basically a skin injury where the blood vessels beneath the skin rupture and bleed. This causes the discoloration that we call “bruising” to occur and become visible. There are a couple different types of bruises a dog may develop. Tiny, red or purple-colored bruises that look like little pin-points are called petechiae. These types of bruises are indicators that blood vessels are leaking beneath the skin within the mucous membranes. Larger bruises (up to a centimeter in size) are called purpura, whereas bruises that are larger than a centimeter are called ecchymoses. Very rarely are any of these types of bruises “just” a bruise. They are usually solid indicators that your dog could be in serious jeopardy and should be seen by your vet as soon as possible. All three types of bruising can come on and appear suddenly, with no prior warning. They can be related to a minor injury the dog has suffered, or be due to something more serious, like severe trauma or the ingestion of a toxic substance. If a dog has not experienced anything traumatic (for instance, getting hit by a car or getting in a dog fight), and you know your dog has not ingested anything poisonous (such as accidentally ingesting the household aspirin or bottle of NSAIDs), you should seek council from your vet. The bruises are more likely to be due to a health condition or internal injuries and bleeding that you can’t see or treat on your own. If you know your pup has not been recently injured or involved in a physical trauma, and you know your canine doesn’t have antifreeze poisoning (or any other type for that matter), your vet can help you determine whether or not something else is causing your dog to bruise. It could be your dog was born with something that causes bruising, or it could be your dog has acquired a medical condition that may be causing it. Congenital means a condition a dog is born with. It also means the condition was likely something inherited from his parents. Two of the most common congenital causes for dog bruising include Von Willebrand disease and hemophilia. Note that clotting diseases can affect humans as well. Certain clotting disorders appear to be more prevalent in some breeds over others. Von Willebrand disease is a disorder that affects a dog’s ability to form blood clots. Blood has something called blood platelets that help to control bleeding by clumping together and “clotting.” The clotting mechanism helps dogs (and humans) stop bleeding quickly if any blood vessels become ruptured. A dog that has a clotting disorder will have lower levels of platelets in his blood, and his ability to form clots will be impaired, leading to excessive bleeding. When there is excessive bleeding, it can leak into a dog’s skin and cause the appearance of bruising. Impaired ability to form blood clots can be highly dangerous, especially if a dog is injured. Your dog could become injured and bleed internally, with disastrous consequences. This is why it’s very important to rule out clotting disorders if you notice your dog has a bruise. 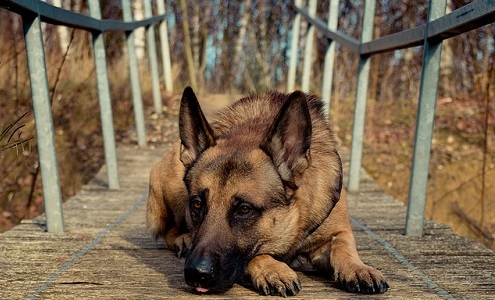 Von Willebrand disease appears to be more prevalent in breeds like the Scottish Terrier, German Shepherd, Shetland Sheepdog, Doberman Pinscher, and German Shorthaired Pointer. If your dog is one of these breeds, it’s important to learn about Von Willebrand disease and arm yourself with knowledge. Hemophilia is another clotting disorder that can create a coagulation deficiency and cause bruising. This disorder most often affects purebred dogs and seems to be more prevalent in males. It’s also more often seen in puppies, although dogs that survive into adulthood are seen as well. Often, in severe cases, puppies will suffer from excessive bleeding and die weeks after being born. Thrombocytopenia can be caused by a few things. One is related to an immune disorder that triggers a dog’s immune system to attack itself and destroy platelet cells that help his blood clot properly. This condition is rare, but not unheard of. Thankfully, it is treatable. Drugs can be used to manage the disease or in some cases, a spleen removal may be recommended. Dogs can also develop thrombocytopenia from other health concerns like poisoning, trauma, and canine chemo treatments. Clotting issues may also be triggered by ingesting toxic chemicals like warfarin, NSAIDs, or rat poison. Genetic disorders like prothrombin deficiency can increase your dog’s potential for bruising (mainly in Cocker Spaniels), while a Factor VII deficiency can cause extensive bruising, especially after something like surgery. Factor VII is seen often in breeds like the Beagle, Boxer, and Bulldog. Dogs can develop something called DIC (disseminated intravascular coagulation) which is often a problem in places like the pet ICU or ER. DIC isn’t a disease, per se. It’s more a complication that arises due to another health problem that hinders a dog’s ability to form blood clots normally. Sometimes dogs suffer from tick-borne diseases that can impair blood clotting. Rocky Mountain Spotted Fever, Ehrlichia, and Anaplasma are three of the most common culprits. Additionally, dogs with metabolic problems caused by cancer or canine liver disease can bruise quite easily, as well as dogs with certain vascular disorders. A bruise is rarely “just a bruise” for a dog. There is almost always a deeper explanation and your dog should see a vet as soon as possible if you notice bruising or discoloration anywhere. Always better to be safe than sorry. Pin-point bruises are often seen in areas like the whites of a dog’s eyes, his gums, his mouth, and even on his genitalia. Larger bruising can be seen often on the tender skin on the inside of the thigh, or the soft underside of the dog’s belly. You can tell it’s a bruise and not just a rash if you press the area gently, and the color doesn’t blanch or fade. In addition to signs like petechiae (pin-point bruises), purpura, and ecchymoses (larger bruises), you may notice your dog present with other symptoms if there is an underlying health problem or trauma that is causing the bruising. You may notice some bleeding from your dog’s nose, mouth, or another orifice. Sometimes a dog will have a cut or injury that won’t seem to stop bleeding. 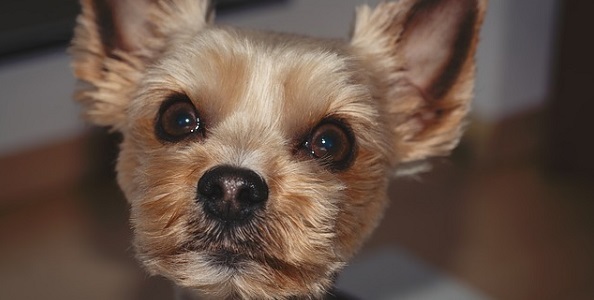 Your dog’s eye could look red due to bleeding or he could display blood in his urine or stool. His gums may be pale from canine anemia caused by excessive blood loss, or present with pin-point bruising and blotchy-looking areas that may be signs of hemorrhage. Other symptoms could include increased heart and/or respiratory rates in dogs and a visible struggle to breathe, especially if the dog is bleeding internally. Dogs may also appear weak or suffer from canine depression, especially dogs that are anemic. Though there can be many reasons for a dog to bruise, you can help your vet narrow it down by giving them a thorough medical history of your dog’s health. A thorough physical exam will be necessary, where your vet will look at your dog’s gums for signs of anemia, as well as check their body for wounds or swelling. Sometimes a vet will order a urine test to see if there is any blood in the dog’s urine. They will want to know if your dog has suffered any recent trauma or injuries, as well as if he has had any recent blood transfusions. If you already know your dog has a clotting disorder, make sure you tell your vet immediately. They will likely want to know about your dog’s parental history, and they will want to rule out the possibility that your dog has ingested something toxic or been exposed to a tick-borne disease. Once your vet rules out the most obvious causes for bruising in a dog, they will move on to other potential causes and run tests to determine what those might be. You can expect blood testing to check for low platelets, clotting issues, and immune disorders, as well as tests like x-rays of the chest and abdominal cavity, just to make sure your dog is not bleeding internally. Ultrasounds are sometimes ordered to check your dog’s organs and make sure they are functioning properly. Organs that aren’t getting enough blood because of internal bleeding will suffer from impaired function. Treatment depends entirely on the root cause of the bruising your dog is experiencing. Treatments can range from administering blood transfusions and IV fluids, to giving your dog plasma transfusions. In addition to plasma transfusions, dogs with immune-related disorders like Von Willebrand, toxicity from rat poisoning, or liver failure may be given vitamin K1 therapies, steroids, and supportive care based on his symptoms. Confinement and rest are essential for dogs that have low platelet counts so that additional bruising and bleeding might be prevented, and in dogs that have a tick-borne disease, antibiotics may be required by the vet. Additionally, the vet may monitor your dog’s respiratory system and provide necessary support if your dog is struggling to breathe properly. There are really no hard and fast rules when it comes to diagnosis and treatment, because the cause of bruising in dogs can be so varied. With that said, seeing a bruise on a dog is highly suspect, because it’s just not very common. You should take it seriously and see your vet immediately if you find your dog has a bruise. “Bruising in Dogs: Ecchymosis.” Pet Health Network, www.pethealthnetwork.com/dog-health/dog-diseases-conditions-a-z/bruising-dogs-ecchymosis. “Disseminated Intravascular Coagulation (DIC) in Pets: A Blood Clotting Disorder.” Pet Health Network, www.pethealthnetwork.com/dog-health/dog-diseases-conditions-a-z/disseminated-intravascular-coagulation-dic-pets-a-blood. “Can Dogs Get Bruises? .” Hill’s Pet, www.hillspet.com/dog-care/healthcare/can-dogs-get-bruises. Farricelli, Adrienne Janet. “Causes of Petechiae in Dogs.” PetHelpful, 8 June 2014, www.pethelpful.com/dogs/Causes-of-Petechiae-in-Dogs. “Bruising and Bleeding in Dogs.” PetPlace, 23 July 2015, www.petplace.com/article/dogs/pet-health/bruising-and-bleeding-in-dogs/.